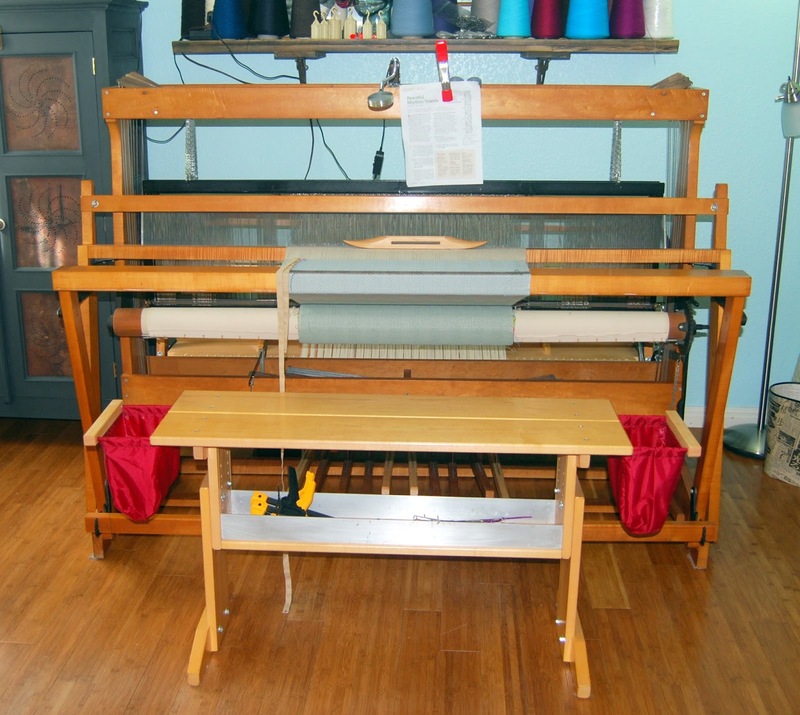 On January 14, 2018, I came across a Facebook post in the Macomber Loom Owners Group of someone wishing to sell her 32" Macomber 4-shaft loom. I moved on it immediately, even though the loom was located in Washington state, because it was my dream to have a second, smaller one to go with my larger 56" 8-shaft. My offer was contingent on securing shipping within so many days. Fortunately, the seller was very friendly and accommodating. I contacted UShip, Freight Quote, and a host of others. The best bid came from TSI. Although, none of them were cheap. The one from TSI was slightly more than I was paying for the cost of the loom, but I received other bids that were twice and three times as much as the price of the loom. It was even slightly more expensive because I felt the need to insure the loom for the replacement cost of it, as well. All of the shippers were basically cross-country movers with semi-trucks and a bit of extra space in their rigs for items. To minimize their costs, they drop off and pick up items along their routes. While less expensive than shipping directly using UPS or FedEx, it takes longer for the shipper to pick up and deliver these odd loads. Thus, I contracted with TSI on January 16th for delivery, but they did not secure the loom from the seller until February 8th. At that time, I was notified that delivery should be within 20 days of that date. About two weeks later, TSI contacted me to advise they expected to deliver on Thursday, March 1st. However, after noon on Wednesday, February 28th, the driver called me to ask if I would be available at 4:30 that day, they were running ahead of schedule. I squealed in delight at that news! They actually did not show until well after 5:30, as my good friend correctly surmised they were caught in Austin, Texas traffic. When they finally escorted her from the depths of the rig and into the light of day, she was carefully shrouded in heavy moving blankets, her harnesses wrapped in plastic bubbles, and her beater covered in paper and a blanket. They rode the tail lift down with her and removed all packing material before gently picking her up and walking her inside. The whole process was so very different from when we moved the Beast home. At over 400 pounds, that loom required a minimum of four men (I continue to heap gratitude onto my dear friends and neighbors who helped that day!) with much straining and sweating. Lil' Miss was a dainty little walk in the park in comparison. After they set her down in the studio and brought in her assorted pieces, one of the men asked: "This looks like an antique, do you intend to actually use it?" He looked between her and the Beast before stepping closer to the latter: "What are you making over here?" The second man expressed interest, too, and asked if he could feel the fabric. I pulled out a few finished pieces and proffered them for inspection. The gentlemen were delightful and appeared truly awed by the fabric. It was nice. I offered them water bottles and a tip as they left. 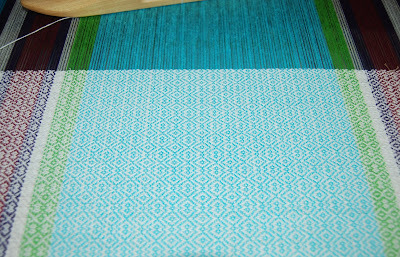 In all, the entire experience from purchase to delivery was a good one, although, I freely admit it was not without a bit of anxiety wondering if I could afford and secure shipping, whether the shipper would package the loom safely, and if it would arrive intact and without damage, as well as whether the loom was in as good a condition, as I had hoped. I knew from the seller her model and serial number were B5 5300 and that she bought it from a lady who purchased it from the Oregon School of Art and Crafts. An email from Macomber revealed she was ordered on November 4, 1968. I am the fourth owner. Given her history, especially her life in a school, it was safe to assume she was used well and hard for the first few decades of her life. That history did not deter me from this purchase because I knew that my Beast was ordered in November 1975 and delivered on August 18, 1976. (I purchased that loom directly from its original owner who had every single piece of paper associated with it!) 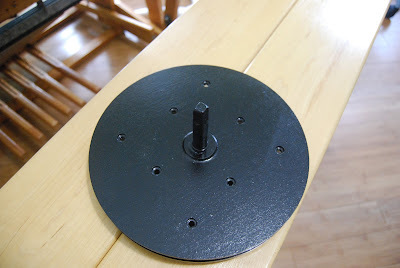 It was made with hard maple, stainless steel, and cast iron. 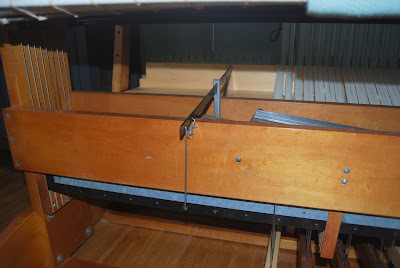 I assumed that any looms manufactured prior to 1975 would also use the same materials, and I was correct. Lil' Miss has cast iron parts, just as the Beast does. Unfortunately, I have recently discovered that sometime since 1975 Macomber has switched from cast iron to cast aluminum. I understand the economics, which probably drove this decision, but I am disappointed by it, especially as Macomber states on its home page: "We use only the strongest, most durable materials available." I respectfully submit cast aluminum is NOT the strongest, most durable material available. This happened in transit, and I understand that things happen. It was not a big deal, and Macomber had great customer service. As soon as I alerted them, they sent out a new one immediately. What concerned me about this was I was expecting this end plate to be made of cast iron, but it was cast aluminum. When I asked Macomber when they had made the switch from one material to another, they did not know. I posted about this in the Macomber group. First, no one knew about the switch. Second, only one person expressed any concern about the change in materials. 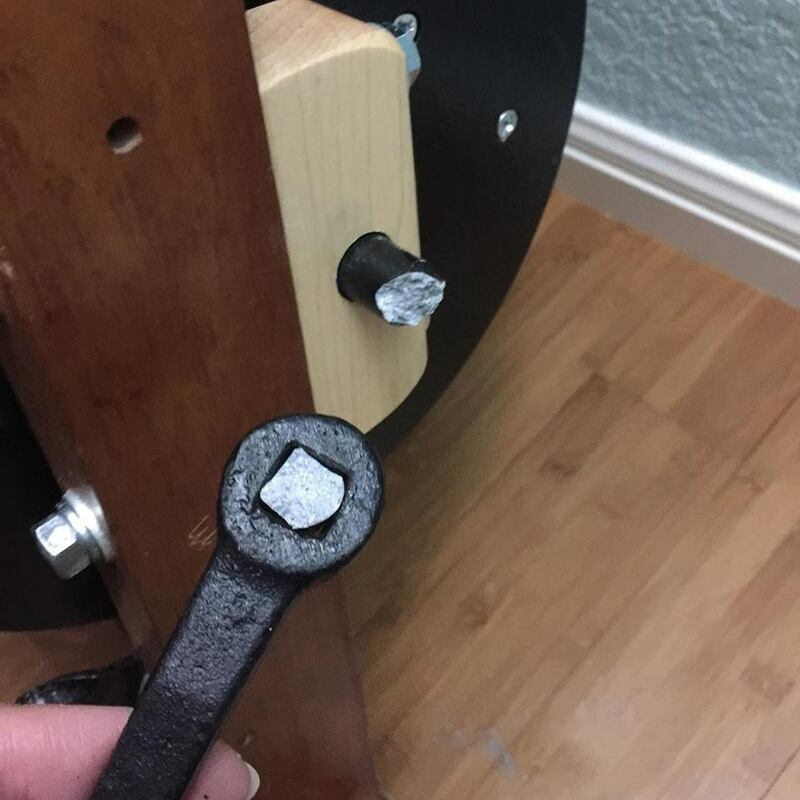 That person reported: "Last year I had to replace a brake dog on a “new” Macomber because it was aluminum and the gear was cast iron. I was told it worn out in about three months. I have this part in my tool box if anyone wants to see a picture. When they started using aluminum parts I do not know." The new piece arrived, and we switched it out without incident. Both pieces were for a ratchet and pawl brake, which I ultimately did not like at all. So, we ended up purchasing another end piece, one which would allow me to convert the brake to a friction one. That brake drum arrived on a Wednesday. We installed it on a Thursday. By the following Monday, five days after its arrival, it broke. Macomber was kind enough to sell me another drum at cost to them. With shipping and another 120 or so dollars, I had a new brake drum, still cast aluminum. I asked if they could provide a cast iron one...they could not. Here is the new one awaiting installation. Do I still love my Macomber looms? 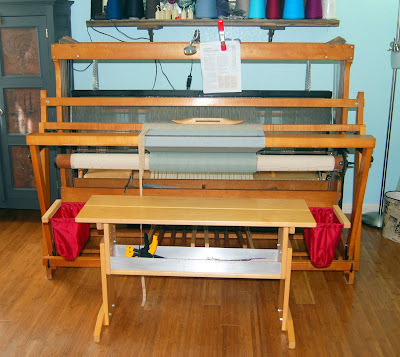 Compared to other looms, I still think they are solid workhorse looms, which are beautifully capable of the finest lace and threads and the most rugged of rugs. 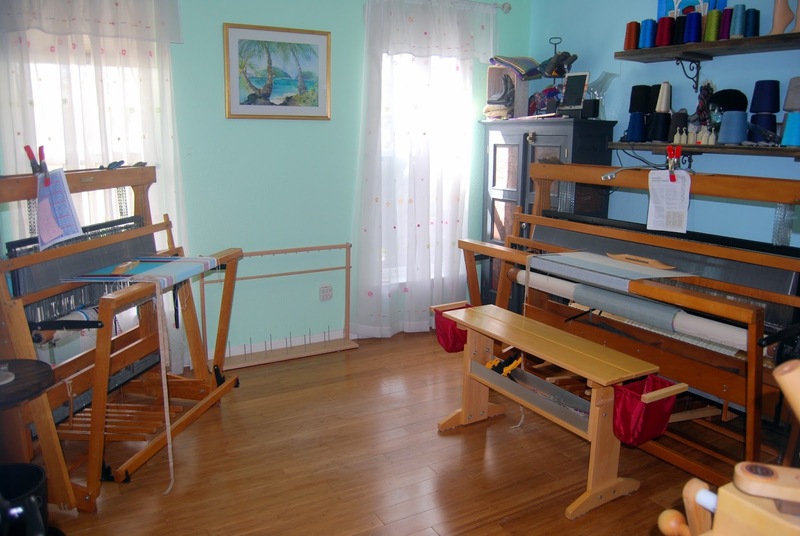 They are designed intuitively with the comfort of the weaver in mind. I love how the front beams open all the way to the floor and the beater can be removed to allow me to sit in the loom to thread heddles. 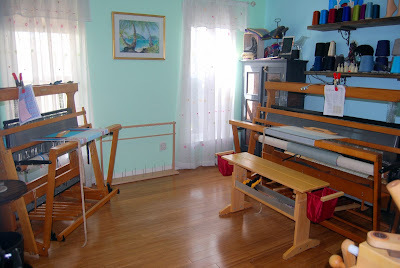 I appreciate the height of the loom, the rear-hinged treadles, which make it easy to treadle, even if I have four or five harnesses attached to one, as well as the heel rest. The lamm depressor is genius! On the Beast, the weight of the beater is enough by itself with minimal exertion from me. Simply put, the Beast is a dream on which to weave. Lil' Miss is delightful. 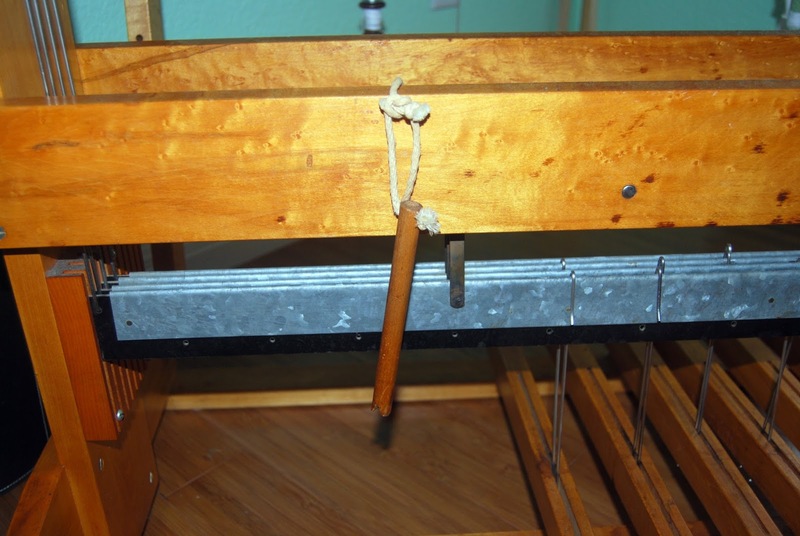 Her beater is much lighter than the Beast, as she is a much smaller loom. She arrived with a plain beam with a ratchet and pawl brake, which will be replaced with a sectional beam and friction brake, just as soon as Macomber can build and send it to me. I actually ordered the beam prior to her arrival. Her aprons are a bit musty. I have a new cloth beam apron on order, as well as new beater bumpers for her. As I did with the Beast, I placed heavy duty felt on the bottom of her feet; however, she weighs approximately half what the beast does, so she slides when I use her. Ha! Leclerc makes rubber feet for their looms. These will have to be trimmed to fit her, but I have four on order to keep her in place and protect my wood floors. As the budget allows, she will be outfitted with four more harnesses. She has an old style lamm depressor, which is quaint and perfectly functional with only four shafts right now; however, when she has eight, I anticipate the new style lamm depressor will be necessary. Thus, when I can order the additional harnesses, I will probably order one of those, as well. Forgive the harsh glare, a flash was necessary. Both of these assist with tie-ups. Starting from back to front, I use them to hold the lamm down to allow me to attach the lamm to a treadle using a "super hook" that Macomber provides. The old style requires me to use one hand to continue to hold the lamm down while I make the hook attachment. The new style has a metal "hook" that slips onto the bottom of the lamm box, which gives me two hands to attach the treadle to the lamm. Here is a fully dressed Lil' Miss. She and I are becoming better acquainted. This maiden warp is ten yards long, enough for 9 tea towels. 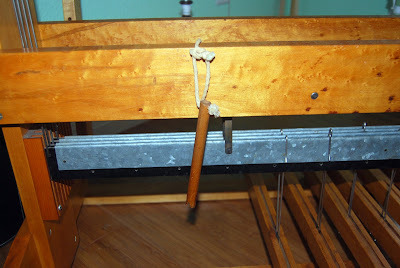 I used 10/2 mercerized cotton for the warp and 8/2 unmercerized cotton for the weft. While I have used 10/2 for warp before, I am experiencing quite a few broken warps, particularly on the far right side. I have replaced several with 8/2. Also, along that side my selvage is uneven, despite the tension appearing the same across all the threads. I may be beating too hard. I know I have not yet found my rhythm with this loom, but hope to by the time we finish the final towel. Despite being constructed exactly like the Beast, the size and weight of her are significantly different. Thus, she weaves differently. This is not a negative, just something to which I need to adjust. Overall my feelings are of gratitude and contentment. I am so grateful my husband is supportive of my passion and willing to help me create the studio of my dreams. I now have exactly what I wanted, and I could not be more pleased! The possibilities appear endless, and I cannot wait to see what lovely fabrics fall from these wonderful looms! I loved reading this post! 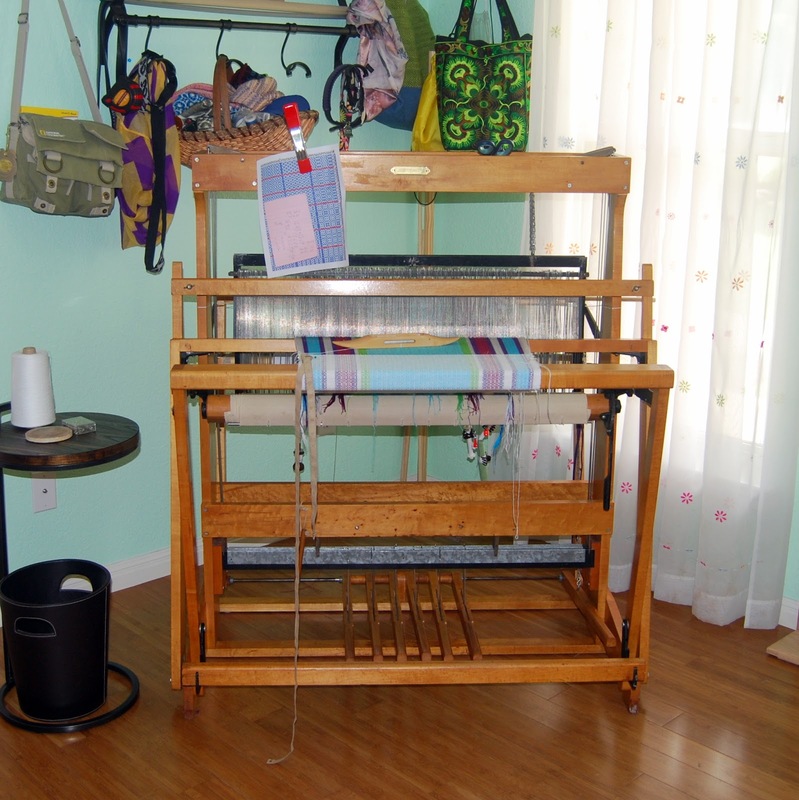 I am a tapestry weaver with several high warp tapestry looms but began my weaver's life as a fabric weaver and teacher at a college where we had Macombers. 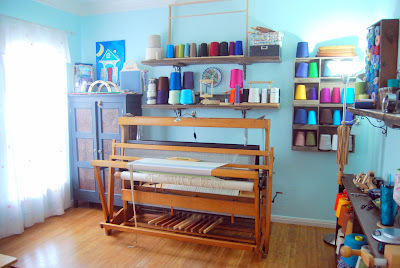 I've loved these looms ever since and have an 8 shaft 42" sitting in my studio right now that I use about twice a year for weaving some fabrics for my house or to give away. 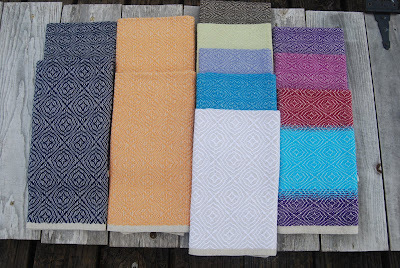 I hope you and the new/old Macomber will find many happy yards of weaving together. A very interesting read. I've got an 8-shaft B type Macomber from the late 1950's which I've cleaned up and am about to warp up with 8 shafts for the first time (I did a test run on 4 and was happy with her). I love the cast iron parts and am looking forward to making my first ever fabric for sewing on this loom, my previous loom was also second hand, but not as nice to use so I have high hopes for Maire (I name my looms). I've had to change some things since I'm in New Zealand and don't have access to the parts here without horrendous costs due to shipping and the state of our dollar. I've changed to Texsolv tie ups as I only had 6 hooks and I use a spanner for the warp beam handle as that didn't come with her either. Rachelle, I am so excited for you!! How wonderful to have a Macomber in New Zealand! What an odyssey your loom must have been on. I have three or four of the old style hooks, if you would like me to gift them to you. Thank you for the offer Christina, but with only 6 it's not really worth it. I have got Texsolv all set up and a few people have found that effective so I'm pretty sure all will be well on that front. Have fun with your new loom. I'm just getting the housework out of the way and then tomorrow I'm warping!